Our pastor told a story in his sermon yesterday entitled “You’re not the Boss of Me” and it immediately brought back memories from my childhood. I’m sure it does for you as well – unless you are an only child. As a middle child, I was bossed by my older brother and lorded over my younger brother. I made Gregg play with me and told him exactly what to do. I was like Lucy from the comic strip Peanuts and treated my little brother like Lucy treated Linus. Poor Gregg! I cut his hair, dressed him up, and made him do homework at 4 years old because he was my student when I began my teaching career at 5 years old. (we are 13 months apart in age and I always knew I wanted to be a teacher) When I graduated from high school, Mrs. Frost, my 1st grade Sunday School teacher, sent me a note recounting the Sunday I brought a flannel graph story left over from my mother’s Vacation Bible School class. I announced that I would teach the Sunday School lesson that week. Mrs. Frost said I was well prepared and confident in my ability to teach. We bossy types are like that. These sibling relationships are a normal part of family life and part of the way children learn to problem solve. It is a chance for siblings to practice those essential life long skills like give and take, taking turns, negotiating for what one wants, and respect of the needs and wants of others. If one child is extremely bossy, it does need to be addressed by parents. A child who is in charge at home will develop patterns of behavior that will be problematic when they begin school and there is a TEACHER! It also can be detrimental to those children who are being bossed. They may not be able to assert themselves and may start to believe their opinions or choices don’t matter. This can be very hurtful to healthy personality development. The most important aspect of this issue is that there should be a boss (or bosses) at home – the parents. Someone will be in charge by default, and if the parents do not take authority – one of the children will. Children are more secure when parents take the proper authority and protect the children from each other and themselves. Learning to respect the parents as their boss will prepare children to respect those in authority throughout their lives. The students I see who have the most difficult time in school are those who do not respect authority. Those students are also the most unhappy. 16 For in Him all things were created: things in heaven and on earth, visible and invisible, whether thrones or powers or rulers or authorities; all things have been created through Him and for Him. 17 He is before all things, and in Him all things hold together. 18 And He is the head (boss) of the Body, the church; He is the beginning and the firstborn from among the dead, so that in everything He might have the supremacy. 19 For God was pleased to have all His fullness dwell in Him, 20 and through Him to reconcile to Himself all things, whether things on earth or things in heaven, by making peace through His blood, shed on the cross. Don’t be afraid as parents to be the “boss” and live out Godly authority before your children. Our hope as Christian parents is that our children will transfer our authority in their lives over to God’s authority and never say to God – “You’re not my boss”. Okay – truth be known – I am easily distracted. (hold the “amens”, girls!) One of our daughters used to call out “Gayle” loudly when “Mom” failed to get a response after three or four tries. That did get my attention! I’ve always said my mind is on higher things – although that may not always be the case. I also have claimed I have an active mind. I am visually oriented, which has served me well as an artist, but occasionally leads to swerving off the road while spying particularly deep blue hydrangeas in someones yard, or noticing a combination of fall foliage that is striking. This is not due to advanced age – I attribute our youngest daughter’s unusually accurate sense of direction to the fact that she started at an early age giving me directions while driving since she realized I had missed a turn or was heading the wrong way. Yet, I can focus when I choose to. As an act of my will I intentionally pay attention to road signs to get to my intended destination – beautiful flowers along the roadside flitting by unnoticed or not. There will always be things that distract me, but I can choose to focus my attention on what is most important. I have visited playgrounds literally all across the country with our grandchildren. 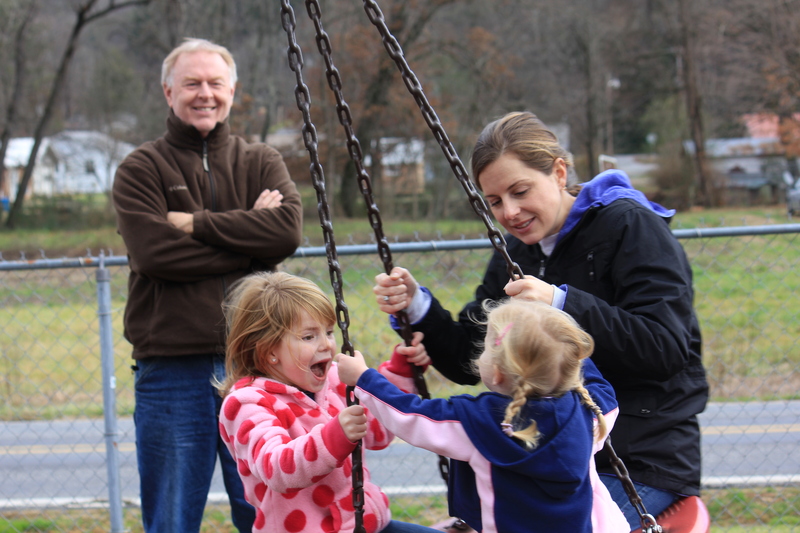 Our daughters all know where parks with playgrounds are located and we have packed picnics and enjoyed playing with our grandchildren as they show us their ability to navigate the jungle gym or slide down the big slide. I love to see children playing outside – running, swinging, jumping, sliding, climbing, yes, and sometimes falling. The joyful abandonment they feel playing in the outdoors is a blessing to watch. I have noticed something that saddens me, though. As we are playing with the grandkids, I notice that many parents are sitting on the perimeter of the play area engrossed in their electronic media. Moms and dads are texting, checking the internet, even playing games on their smart phone while their children are unnoticed and sometimes unsupervised. They are not “playing together” – parents and children are isolated from each other by the distraction of their phones, etc. I have had little boys and girls come up to me while playing with my grandchildren and ask me – a total stranger – “Watch me slide down – I can do it!” or “Will you push me next?” “Look – I can climb up all by myself!” These children see me bragging on my grandchildren, catching them, pushing them on swings, playing with them, and they want that same attention – but it is not available for them. I have a sense that sometimes the parents bring their children to the playground so the children will not distract the parent while the parent is using their electronic device. Certainly their is a time and place to use I-Phones, Kindles, etc. Yet parents are missing out on a wonderful opportunity to play with their children at the playground. I will venture to say that there is opportunity to do both at a playground – play with your child and let the child play by herself or with other children. Yet I have watched parents look up in disgust when a child repeatedly calls for their attention – either looking like they are upset for being distracted from their I-Pad, or even saying – “Not now – can’t you see I’m busy?” It is important to be intentional about interacting with our children – that does not mean saying “Good Job” without looking up from Facebook! It is likely that in most all these situations the parents are loving, caring individuals. They are just distracted. At that moment – something is more important to them than their children. What message is this sending to their child? Let us make an intentional effort on focus on what really matters as mothers and daughters of our heavenly Father. 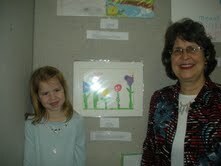 Yesterday I had the delightful experience of attending our oldest granddaughter’s first art show. The theme of the show was “Diversity” and she had painted a lovely picture of colorful flowers illustrating the diversity of color in our world. As an art teacher, I realize that selecting the winning entries for an art show is a very subjective endeavor, and I was pleased that our granddaughter’s work was selected. It was fun to attend with her family and celebrate her artistic talent together. Nana, the art teacher was so proud! I’ve thought about how much joy we feel as parents, and now as grandparents, when a child or grandchild follows in our footsteps and does something we enjoy or love to do. Parents who enjoy sports, fishing, hunting, sewing, piano, etc. are thrilled when their child shows interest and ability in those pursuits. It is SO MUCH FUN to enjoy these activities together. Think about the joy our heavenly Father feels when we delight in the things that matter to Him. Our culture is full of opportunities to improve ourselves or various aspects of our lives and the lives of our loved ones. Promises of health and prosperity abound. Yet, God is clear, we must DELIGHT IN HIM, then He will fulfill His purposes in and through us. Our Heavenly Father wants to bless us when we chose to follow in His ways. I am encouraged by the message of the above scripture that if I delight in God’s law – I will be like a fruitful tree. What a promise! As much as I am blessed by my granddaughter’s artistic talent, more than anything I want her and all our grandchildren to learn to delight in God and His ways. Therefore, I must set the example of delighting in God myself so that they will see God’s purpose fulfilled in my life and want that themselves.